Business culture: what exactly is it, and how do I create the right one? I often hear from my clients that they struggling to create the right culture in their business. While they may have the best intentions, they simply don’t understand what a business culture is, let alone how to go about putting the right practices in place to create one. The right culture for your business isn’t something that will just happen naturally or overnight, so before you even begin to understand what your culture is or what you would like it to be, you must first understand what exactly you are looking for. If we apply the concept of culture to business, it simply means a set of beliefs, values or ways of doing things that are not only accepted by all employees, but most importantly, reflected in what they do. Whether it is the way performance reviews are conducted, or even the layout of the office, business culture is implicit in the actions and behaviours of employees, employers, and the business as a whole. Essentially what you are looking for is a consistency between how you see your business, how your employees see your business, and how the public see your business. If you consider your business to be quite innovative and forward thinking, yet your employees would say it’s a traditional style of business, it signifies that the culture or way you wish your business to be isn’t quite there in practice. What a business culture means in the real world, however, is different for every business. While some businesses may choose to focus on a set of core values that are to reflected throughout the business, others use team training or building exercises to explore with employees what is great about the business and what needs to change. Look for inspiration: Identify employees who you think really embody the culture of your business or what your business is all about, and discuss with them how they would describe it. What do they think is the trademark of your business? Is it the way there is open and honest communication between all levels of the business? Is it the importance of having a good work-life balance? They may articulate for you exactly what the key to your business culture is, or identify something you hadn’t even considered as noteworthy. Be the culture you want to see: Employees look to leaders to see the correct way to act. You cannot expect your employees to be embodying your culture if it’s not reflected in what you do as well. Rather than being exempt from the culture, you should start to think of yourself as the culture: embodying the type of company you are trying to be through your leadership. Communication is key: Who your business is and what it is about can never be overcommunicated, both through formal and informal channels. Not only should your employees understand your culture, they should also know why it’s important – for both them and the business. 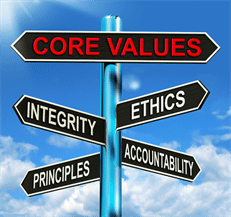 Also recognise that as your organisation grows and changes, so too will your values. You cannot expect your employees to keep up with these changes without you pointing them out. Whatever your business culture looks like, the importance of having a good culture cannot be overstated. A good business culture not only improves employee performance as there is a recognised way to behave and act, but it leads to better communication between all levels of the organisation, and translates across to sales and revenue – a business that has a distinct culture that its customers can relate to will do far better than a business that people aren’t really sure what it’s all about.